Welcome to Dr Seuss Quotes. 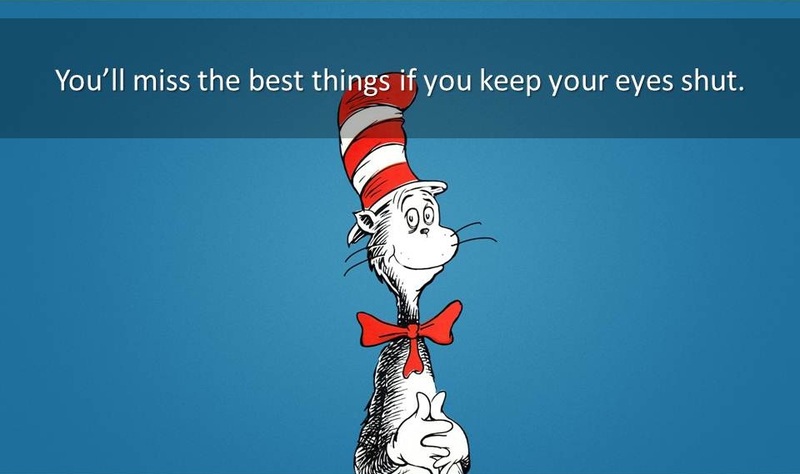 Here you will find famous quotes and quotations by Dr Seuss. An Isn't has no fun at all. No, he disn't. An elephant's faithful one-hundred percent! The storm starts, when the drops start dropping. If you'd never been born, then you might be an Isn't! And the Grinch, with his Grinch-feet ice cold in the snow. Poor empty pants.A person's a person, no matter how small. Things may happen and often do to people as brainy and footsy as you. He who makes a beast out of himself gets rid of the pain of being a man. ASAP. Whatever that means, it must mean, 'Act swiftly awesome pacyderm! In my world, everyone's a pony and they all eat rainbows and poop butterflies! There's no limit to how much you'll know, depending how far beyond zebra you go. Preachers in pulpits talked about what a great message is in the book.No matter what you do, somebody always imputes meaning into your books. I’m glad we had the times together just to laugh and sing a song, seems like we just got started and then before you know it, the times we had together were gone.